I perform with People’s Liberation Improv, an improvisation (or improv) group in Hong Kong, and I and many other improv performers around the world have found that improv is a very effective tool for helping people to develop their creativity and thrive in a complex, volatile, unpredictable world. Improv is also great for developing skills in leadership, teamwork, trust, communication, selling, risk-taking, thinking on your feet, problem-solving, embracing failure and dealing with change – all valuable skills in business. 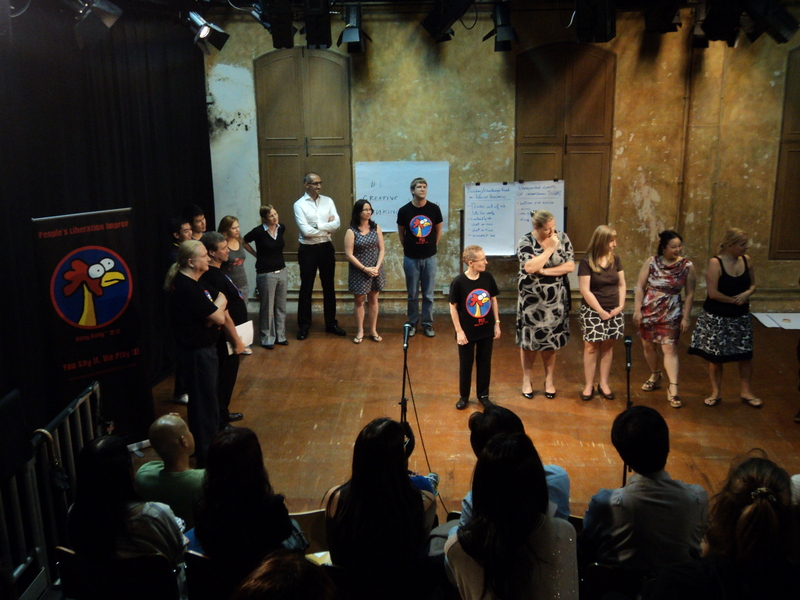 In fact, many improv performers and groups around the world teach workshops for companies, non-profit organisations and community groups about how the principles and mindset of improv apply to life, business and group dynamics. We call that concept “applied improv”, and there’s an international organisation called the Applied Improvisation Network. Improv is even taught in many leading MBA programmes around the world. Over the past few years, I’ve compiled a humungous list of resources (newspaper and magazine articles, blog posts, videos…) about improv and applied improv, and more generally about the related topics of creativity, play and innovation. And I keep finding new goodies every day. Recently, in response to a request from someone on the Facebook group page of the Applied Improvisation Network, I extracted a shorter list of what I think are the most useful resources, and I’ve decided to share it with the world. For free. Enjoy! Is my list useful to you? Would you like to recommend other resources that I can include in the next edition of the list? Do you perform with an improv group? How do YOU apply the principles and mindset of improv to your life and business? Do you teach applied improv workshops? If so, how do you educate and persuade your potential clients about the value and relevance of improv? And what kind of results have participants and companies reported? Please post a comment below or send me an email. And if you love improv, follow me on twitter: @kayross. Wonderful. Many thanks for sharing! You’re welcome, Brigid. Glad you find it useful. Thanks Robert! Do you mean that the link to the PDF of the full 16-page list doesn’t work? If so, sorry, I’ll fix that. And I can email the PDF to you if you want.